Families come in many configurations, and every one is unique, made up of the personalities of each member. But the love that connects families is universal. Whether it is the love of parents for their children, the love between a husband and wife, the love between siblings, a love that transcends generations, or even the love for a family member never met, the family ties that bind us are the strongest and deepest emotional connections we experience. Families influence a person’s development, how they treat others, and how they view life. 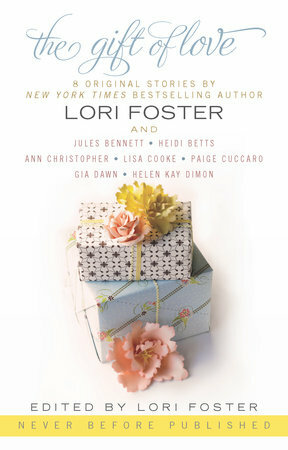 In The Gift of Love, eight exceptional writers offer a variety of unique perspectives on what family love means and how it impacts our lives in ways profound and often surprising. HelenKay’s Story: Second Time Around – Serena Davis was over Heath Sanders. He spent high school ignoring her. Fine. She was a grown woman now. In fact, she barely noticed when Heath moved back to town with his son…well, maybe she noticed a little. After all, she wasn’t dead. Any woman would notice. But when Heath’s son ends up in her English class and Heath starts coming up for all sorts of reasons to talk with her, Serena knows her anti-Heath vow is in serious danger of being broken. **All author and agent proceeds from the sale of the book will go to benefit The Conductive Learning Center, a special school for children with spina bifida and cerebral palsy. Oh, but she did. She moved away for a few years, got married only to get divorced when her idiot husband cheated, and then eleven months ago came back to Glen Ridge, the cozy bedroom community just outside of Washington, D.C., to rebuild her life near her sister. But she never forgot Heath. The same handsome senior who had lived across the street and who she dreamed about marrying in that way only a sophomore girl lost in the confusing space between infatuation and true love could do. All these years later she still blushed when she thought about the awkward fifteen year old version of herself and the way she threw herself at him. Despite the shyness, she made a pass and offered him something precious and special…and he laughed at her. “You sure we’re not dealing with something else here?” he asked, his mouth twitching as if he wanted to laugh at her again. The adult in her had survived all sorts of heartbreak. With all her accomplishments she should have been immune to the insecurities. If the tumbling in her stomach were any indication, she wasn’t. “We were talking about Nate,” she said. At this brief distance she could smell the crisp coolness of the outdoors on him. That was enough for her to push back in her chair. If she wanted the scent of sunshine and changing seasons she could walk outside and take in a big whiff of October. Inhaling the air around this man could only lead to trouble. “There is no us,” she said, ignoring the old sadness that descended over her heart when dealing with that reality. Reading this book reminds me of what I love about romance – that pleasant feeling of happiness and belief that everyone deserves and can have their own happily ever after. …a wonderful hero, dedicated to his son and his uncle, and with just the right amount of cockiness to be endearing and win his heroine.